EyeWitness 2.0 Release and User Guide! For the past few months, the EyeWitness codebase has gone through multiple refactors, nearly all by Rohan Vazarkar (@CptJesus), but also myself. One thing that I try to preach, and any developer should agree with, is that there are three primary features a script/tool needs to have. It needs to be usable, perform a service of value (otherwise why even write it), but it also needs to be stable. With the recent updates to the back-end libraries EyeWitness uses, we failed on that last feature. At times, EyeWitness would seem to just crash on us, but then run perfectly seconds later. After many assessments of encountering these shared frustrations, we decided to start from scratch. 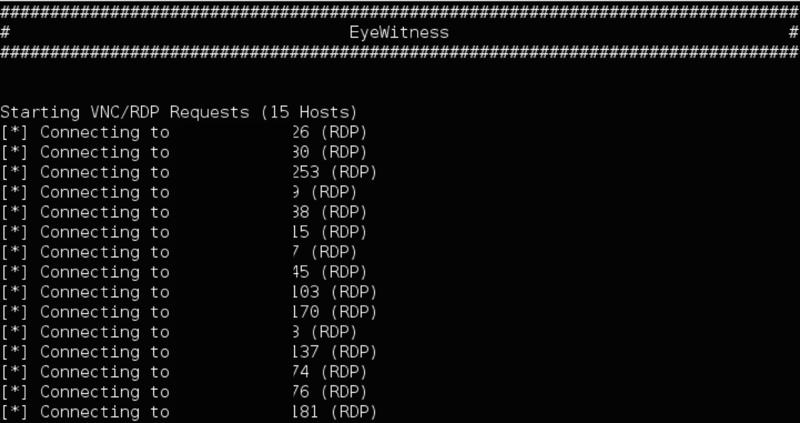 As of now, I’m happy to release EyeWitness 2.0, a complete re-write from the ground up. We took stability as the driving goal for our design decisions, and which libraries to use, and made the 2.0 version something that we are really happy to finally push out. This post will serve as a user’s guide, to show how to use the primary features of the tool. Note: There’s more options available than what is displayed above. First, let’s talk about the original/primary goal of EyeWitness, taking screenshots of websites! We removed Ghost from EyeWitness, due to stability reasons, and added in two different methods of taking screenshots. 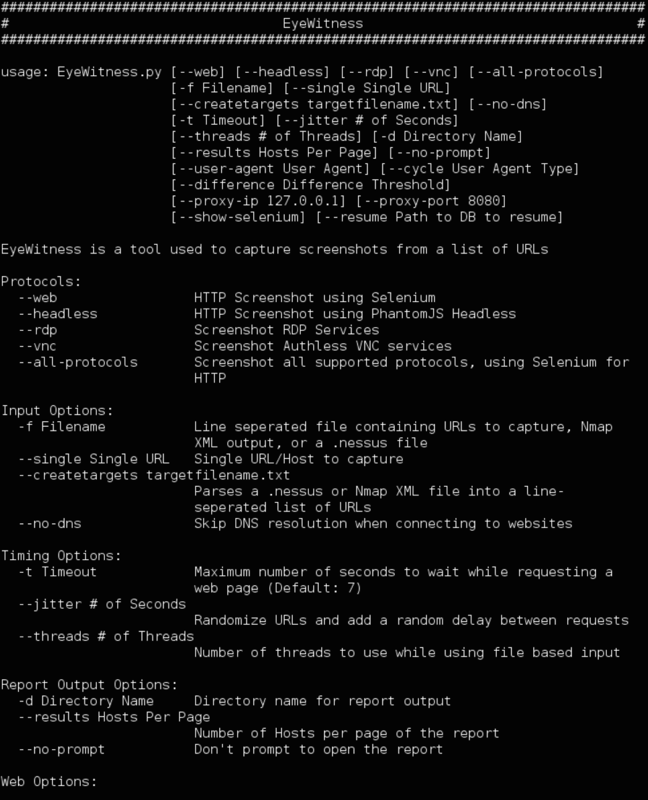 When using –web, EyeWitness will call selenium, which uses the actual browser (IceWeasel or Firefox) installed on your system, to take screenshots. You won’t see s browser pop-up, but it’s running in the background, and taking screenshots of the URLs that you provided. Due to the fact that we encountered a large number of issues when relying on a single library to take screenshots, we decided that we didn’t want to have another single point of failure, so we added in another option when it comes for web screenshots. 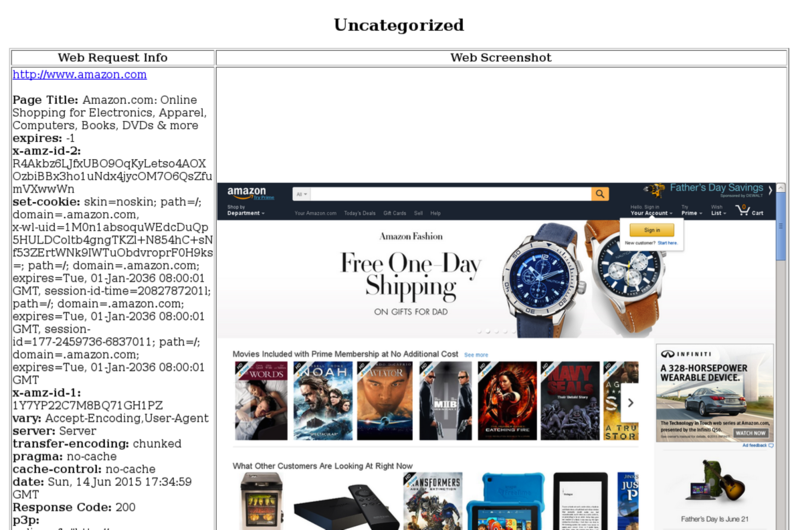 You can use “–headless” to use phantomjs to take screenshots of websites. The nice thing about phantomjs is it’s very fast, and can run in a headless environment. Finally, probably the most requested feature we’ve had for some time is for EyeWitness to thread its requests. I’m really happy to say that threading has been added into EyeWitness! By default, EyeWitness will use 10 threads, but this number can be adjusted by the user with the “–threads #NUMTHREADS” option. The ability to run threaded scans has significantly cut back on the amount of time required to scan all URLs provided to EyeWitness. Next, we’ve added in the ability to take screenshots and generate a report for RDP and VNC all because of the awesome work by Sylvain Peyrefitte (@citronneur) and the RDPY project. 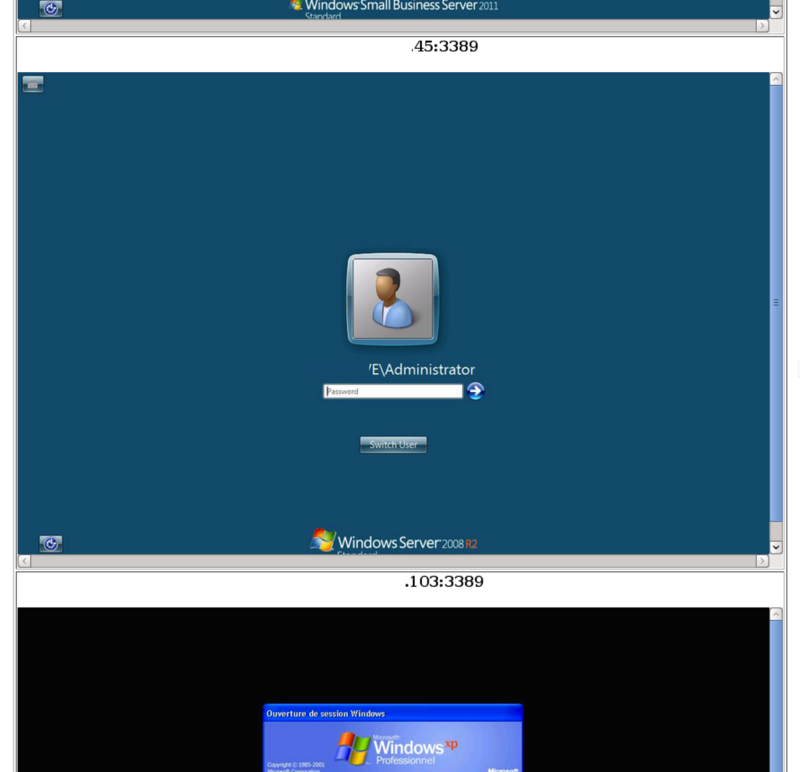 Now, all you need to do is use the –rdp or –vnc switch, and EyeWitness will attempt to screenshot either service. RDP screenshots will take a picture of the login screen, which will potentially also capture any other user accounts currently logged into the system. VNC screenshots will attempt to connect to a VNC service which doesn’t require authentication, and capture a screenshot of the VNC environment. Due to the stability issues EyeWitness had in the past, we ran into instances where EyeWitness may get 90% of the way through a scan, crash on a single host, and would have to start all over. This was another major point of frustration for Rohan and myself. This was initially solved by Robin Wood (@digininja) when he provided us with a script that would generate a report based off of the currently available information that EyeWitness had gathered. We also wanted to look into this, and have now added in proper resume support! As of this 2.0 update, EyeWitness will use a sqlite database to track the systems that are queued up for screenshots, and then mark them complete in the database once done. In the event of a crash, or of the user CTRL + C to quit out of the scan, the latest information will be saved to the sqlite DB, which is in the report output folder. Once the user is ready to resume their scan, you just need to call EyeWitness with the –resume option, and pass the location of the database file. The above pictures are what you should see when canceling a scan, and then resuming it at a later time. Finally, the last new feature I want to go over is the new report generated by EyeWitness. EyeWitness will still attempt to identify default credentials for each web application that it scans. 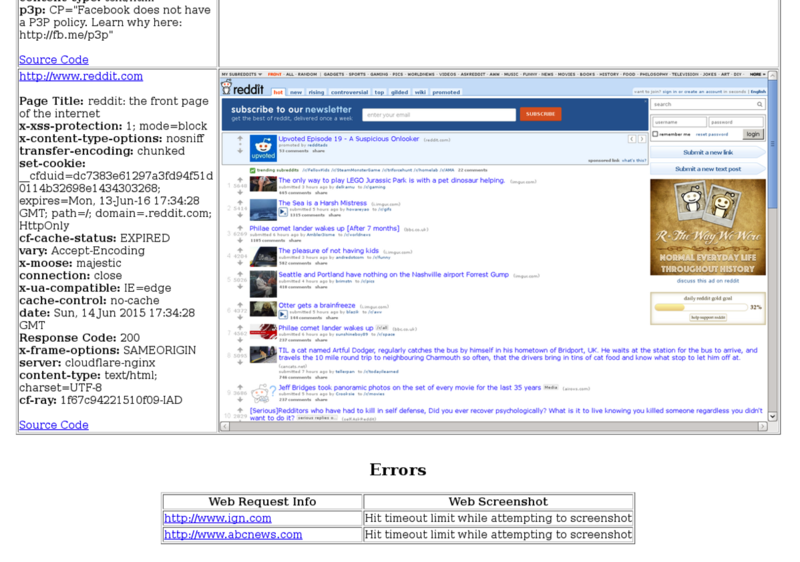 However, a new report layout was created for the 2.0 release. Not only does the EyeWitness report perform default credential checks, it also now will attempt to sort out and group different types of web applications together. 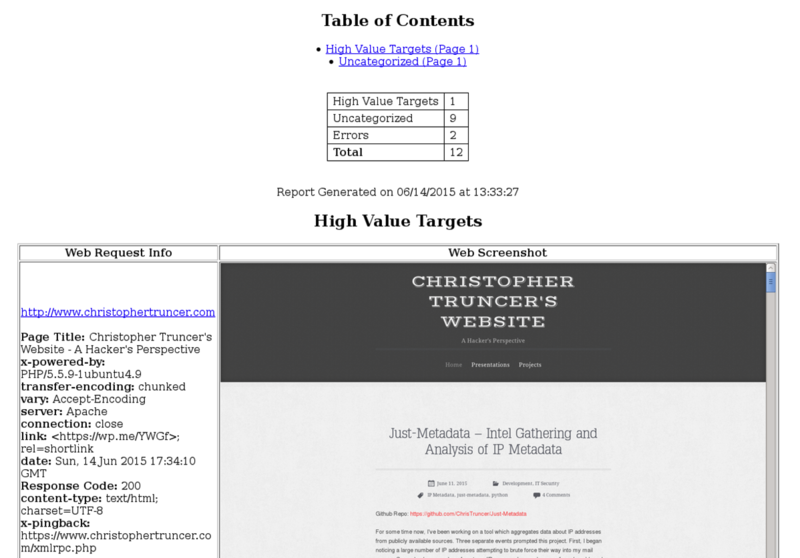 We’ve created a group called “High Value Targets” which may have admin login links available, or any other target that might be of immediate interest to the user, such as Tomcat servers. The report will have a table of contents at the top, which can be used to jump right to any section of the report. One request that we had from Steve Borosh (@424f424f) was to make our report searchable. Initially, we turned this down because we didn’t want to require a complete back-end database, we wanted EyeWitness Reports to be portable. 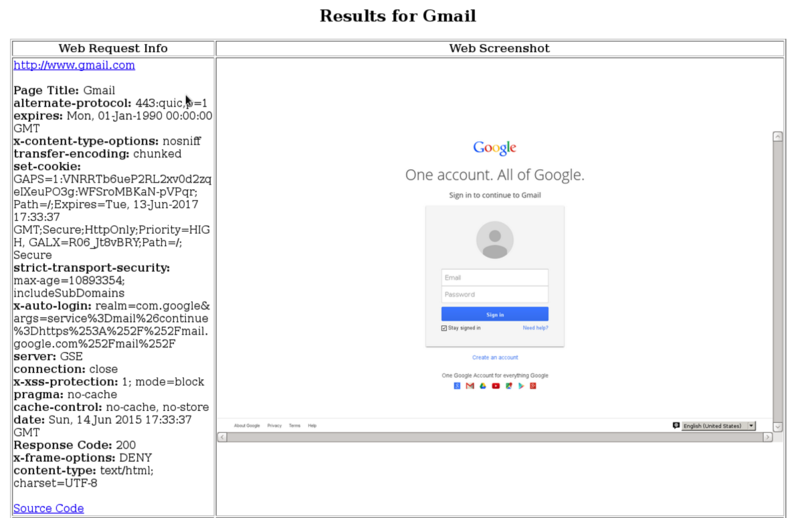 However, Rohan created a search script which will parse the sqlite database that’s created with each scan and generate a report based on what you’re searching for. Want to test it out? It’s easy, just call the search script, pass in the path to the sqlite database, and provide the search strings. A new report will be created containing the results! We hope that this helps to explain the major updates to EyeWitness! If there’s any questions you still have, feel free to contact @CptJesus or @ChrisTruncer on twitter, in #Veil on Freenode, or leave a comment below. Thanks, and hope this helps!